Bobbins were a very necessary part of a cotton mill – As the cotton milling industry grew, so did an insatiable demand for bobbins. These are the small wooden cores upon which the newly spun cotton thread would be wound. Literally thousands were being used at any one time, and once loaded with cotton thread they would either be fed into the next process or be despatched to the customer. Either way they had to be replaced on the spinning machine by another empty bobbin. This necessitated a continuous and reliable local supply of well made bobbins. There were two bobbin mills in Bollington turning tree trunks into little bobbins. No doubt they also relied on their cotton thread customers to return their empty bobbins – they were certainly not a ‘use once and discard’ product. Unfortunately, despite the vast numbers in use, we do not have a single example of a bobbin for display at the Discovery Centre , so if you know where there is one that I could obtain or picture do please let me know! 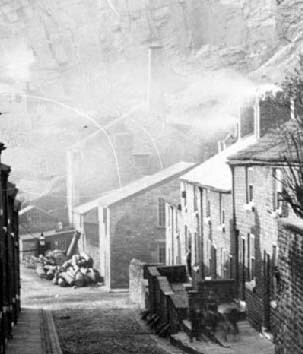 Some of the operatives in the mills who were responsible for loading, threading and unloading the bobbins were known in Bollington as cone winders. The two bobbin mills in Bollington – one was in Queen Street next to Defiance mill, the other was Lomas’s Bobbin mill adjacent to bridge 28 on the Macclesfield Canal at Kerridge. The bobbin mill was located at the bottom of Defiance Brow (the uphill part of Queen Street today) next door to Defiance mill. It was water powered and probably shared the same wheel and water as Defiance mill, with the mill pond in Pool Bank. 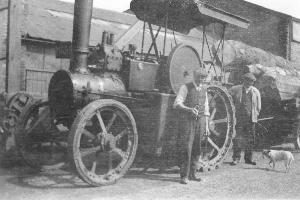 The two mills were in the same ownership at some time. By 1860 Edmund Barnes and, later, Thomas Pimlott, were wood turning and bobbin making in both. In the late 19thC, Thomas Pimlott and Thomas Gatenby were bottling water and lemonade in the mill. See Brewers and Bottlers. It is probable that before the bobbin mill was developed, Queen Street passed through the site and across where Hamson Drive is today to join Ingersley Road somewhere close to where the roundabout is today. At some stage (c.1960s? ), the bobbin mill was demolished and the space used by Oak Bank mill. Once this went in the 1990s, modern cottages were built on the site. In the picture, the bobbin mill is the low building across the middle. In the background left is Beehive cotton spinning mill, the house on the right is Bobbin cottage (known in 1871 as Albert cottage, and in 1909 as Daisy cottage) which still stands. The bobbin mill has very largely gone – there is a very small amount of stone wall and the base of the chimney remaining, and can be seen in the garden as you pass along the canal towpath. 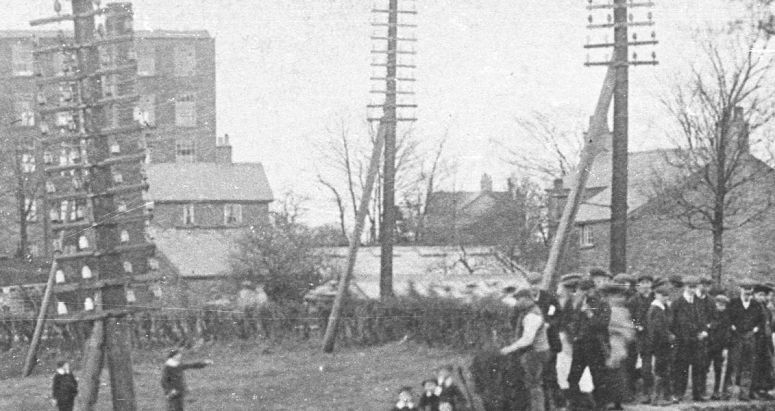 The chimney can just be made out in this picture – it is to the left of the mill, and stands just to the right of the telegraph pole at the left of the picture, almost hidden by the horizontal bars on the pole. This picture is a small portion of one taken to illustrate the Kerridge canal breach in 1912. 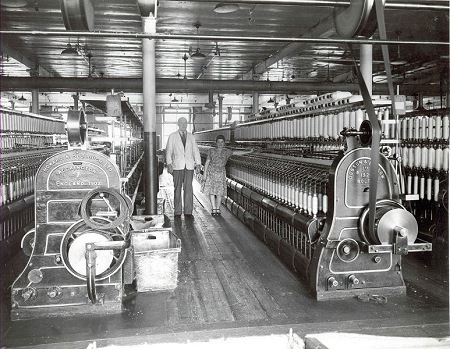 The white freshly spun cotton is being fed onto bobbins in Clarence mill c.1920. 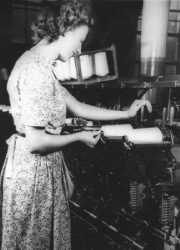 Eunice Hallworth, bobbin winding in 1950.